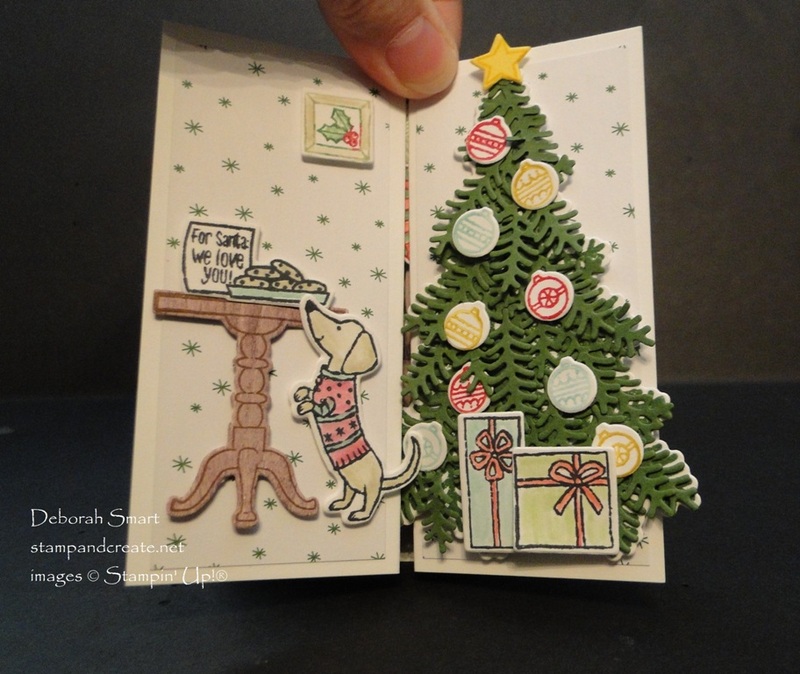 Today I’d like to share a fun, fancy fold card for Christmas with you! This card was fun to make, using the Ready for Christmas Bundle. 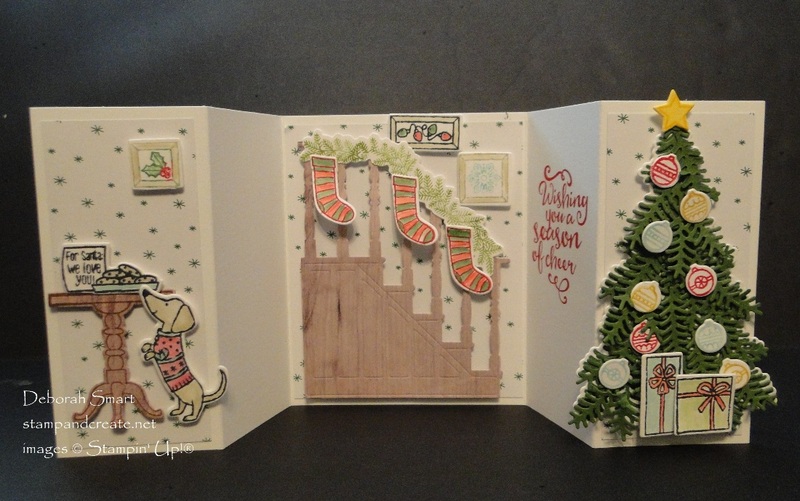 This Bundle includes the Ready for Christmas stamp set, and the coordinating Christmas Staircase Thinlits Dies. While the set was created for holiday scenes, a lot of the images can be used for any occasion! The picture above is of the card when folded. You can see the left & right sides of the card create a cute scene when the card is closed. Below, have a look at the open card! How cute is this?! You can see the whole holiday scene, and you still have the stamped sentiment on the right, with a clear panel on the left to write your holiday message. The great thing is that closed, this card fits into our standard envelope! Ready for Christmas stamp set, Christmas Staircase Thinlits Dies, Big Shot, Be Merry Designer Series Paper, Wood Textures Designer Series Paper Stack, Blender Pens, Ink Pads in Real Red, Pear Pizzazz, Garden Green, Crumb Cake, Pool Party and cardstock in Garden Green, Whisper White and Thick Whisper White, Stampin’ Dimensionals, Multipurpose Liquid Glue and Mini Glue Dots. The card base is Thick Whisper White cardstock that measures 4 1/4″ x 11″. To create the panels, score and fold at 2″, 3 3/4″, 7 1/4″ and 9″. Cut three panels of Be Merry Designer Series Paper (star pattern) 2 x 1 3/4″ x 4″, and 1 x 3 3/4″ x 4″. Attach the DSP to the 2 front panels and centre panel using the Multipurpose Liquid Glue. The table is stamped onto a piece of the Wood Textures DSP in Soft Suede ink. I then die cut it and the staircase (also in Wood Textures DSP) with the Big Shot and Christmas Staircase Thinlits. The tree was stamped onto Whisper White cardstock in Garden Green, then the outline die cut with the matching thinlit. Then I die cut the tree branches from Garden Green cardstock, again using the Thinlits, then attached them to the tree outline, using Mini Glue Dots. This gives the tree extra dimension! After stamping the dog, presents, wall pictures and stockings, I used the Blender Pens to pick up ink from the ink pad lids to colour them. The garland is stamped in Pear Pizzazz ink, the star in Crushed Curry ink onto So Saffron cardstock, and the ornaments in Pool Party, Crushed Curry and Real Red ink. All of the pieces are then die cut with the Big Shot and Christmas Staircase Thinlits Dies. They are then attached to the card base with either Stampin’ Dimensionals or Mini Glue Dots. Ink the sentiment in Real Red ink, and stamp on the inside right panel. I realize this is a lot of die cutting, and it’s not all necessary! But it does add so much, and makes this a special card. It’s certainly NOT one for mass producing!! You could make it easier by simply stamping the main elements such as the staircase, tree and table, then adding a few stamped a die cut pieces. In my opinion, because so many of the elements in both the stamp set and thinlits can be used year-round, for multiple occasions, this Bundle is a great buy! You will definitely get your money out of the times you will use it. Order the products I used to create this card by clicking on the images below. You can order direct from my online store 24/7 – whenever it’s convenient for you! Thanks for taking the time to visit me today! Such a fun card! I love the fold, and that little dog always makes me smile. Wow! This is quite a card. You did a beautiful job! Ha ha! I did get a *little* carried away, didn’t I? 🙂 Oh well – glad you like it, Susan!